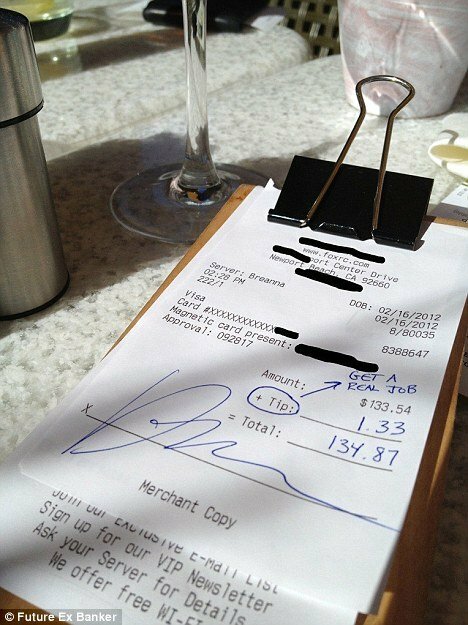 A banker dining at True Food Kitchen restaurant in Newport Beach, California, left only $1.33 on a $133.54 tab, enforcing his position as the “one per cent”. His belligerent behavior at the restaurant was documented by his dining companion, who posted a photo of the receipt to Twitter, alerting Eater’s Receiprocity blog. The post – and corresponding blog – was later deleted. The disgruntled employee continued: “[My boss] has blatant disregard and outright contempt for everyone and everything he deems beneath him. While servers often receive the brunt of a diner’s anger in form of a low or non-existent tip, it is customary to tip a minimum of 15% for good service. A hostess for True Food Kitchen told LAList.com that she had heard about the receipt but could neither confirm nor deny if it was real, nor if she remembered the customer. “We have no statement on the issue,” the hostess said. Vice President of operations for True Food Kitchen told the Huffington Post that the receipt in question is real, but they’re in the process of tracking him down. “We are the 99 per cent” was runner up to “occupy” for 2011’s word of the year. The phrase is closely tied to the Occupy Wall Street movement, and states that one per cent of Americans have a disproportionate amount of wealth. The Wall Street Journal states that someone must be making at least $506,000 before joining the elite one per cent of top American earners.